The arc fault current is usually much less than the available bolted fault current and below the rating of circuit breakers. Unless these devices have been selected to handle the arc fault condition, they will not trip and the full force of an arc flash will occur. The electrical equation for energy is volts x current x time. 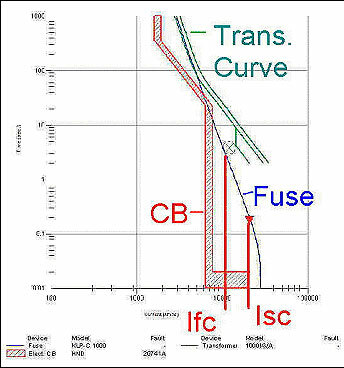 The transition from arc fault to arc flash takes a finite time, increasing in intensity as the pressure wave develops. The challenge is to sense the arc fault current and shut off the voltage in a timely manner before it develops into a serious arc flash condition. Why the focus on Arc Flash? OSHA 29 Code of Federal Regulations (CFR) Part 1910 Subpart S.
NFPA 70-2002 National Electrical Code. NFPA 70E-2000 Standard for Electrical Safety Requirements for Employee Workplaces. IEEE Standard 1584-2002 Guide for Performing Arc Flash Hazard Calculations. Warning labels on equipment. Note that the labels are provided by the equipment owners, not the manufacturers. It is expected that the next revision of the National Electric Code will require that the labels contain the equipment's flash protection boundary, its incident energy level, and the required personal protective equipment (PPE). 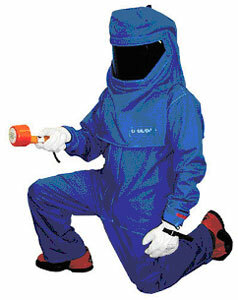 Cal/cm2 are the units of incident energy that the PPE can withstand. Note that a hard hat with full-face shield and the appropriate gloves are required also. 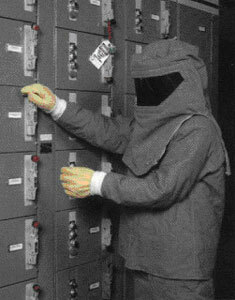 To perform an arc flash hazard analysis, data is collected about the facility's power distribution system. The data includes the arrangement of components on a one-line drawing with nameplate specifications of every device. Also required are details of the lengths and cross section area of all cables. The utility should be contacted for information including the minimum and maximum fault currents that can be expected at the entrance to the facility. Once the data has been collected, a short circuit analysis followed by a coordination study should be performed. The resultant data can then be fed into the equations described by either NFPA 70E-2000 or IEEE Standard 1584-2002. These equations will produce the necessary flash protection boundary distances and incident energy to determine the minimum PPE requirement. Once the data is prepared and a flash hazard analysis has been performed, most likely it will be discovered that category 4 PPE will be required in most places. This is most unfortunate as this type of PPE is very unwieldy and could be costly in terms of time taken to perform work and the potential for mistakes. Prior to the new arc flash regulations, coordination studies were targeted at reliability with all settings adjusted towards the high side. Compliance with the new arc flash regulations means that not only does the coordination study need to be more accurate but it also needs to take into account the fact that the arc fault current is less than the bolted fault current. The data can be used to perform a sensitivity study to adjust breaker/fuse characteristics to lower the PPE requirement. To achieve this goal, the existing breakers may need to be replaced, generally by more modern counterparts. Old breakers have relatively slow reaction times and will trip at too high a current. To limit the flash hazard the breakers are adjusted to trip earlier than before. It is expected that the outcome of this sensitivity study, when implemented, will result in most category 4 PPE requirements being decreased to category 1 or 2. The short-circuit study is based on a review of one-line drawings. The drawings must be created if they do not exist, and field-verified if they do. Maximum available fault current is calculated at each significant point in system. Each interrupting protective device is then analyzed to determine whether it is appropriately designed and sized to interrupt the circuit in the event of a bolted type of short circuit. Next, the associated equipment must be reviewed to insure that the bus bar is adequately braced to handle the available fault current. Finally, the bolted fault currents are converted into arc fault currents for additional analysis. A coordination study is the examination of the electrical system and available documentation with the goal of ensuring that over-current protection devices are properly designed and coordinated. Over-current protective devices are rated, selected and adjusted so only the fault current carrying device nearest the fault opens to isolate a faulted circuit from the system. This permits the rest of the system to remain in operation, providing maximum service continuity. The study consists of time-current coordination curves that illustrate coordination among the devices shown on the one-line diagram. Note that protective devices are set or adjusted so that pickup currents and operating times are short but sufficient to override system transient overloads such as inrush currents experienced when energizing transformers or starting motors. Now that the hazards associated with arc flash have been brought to our attention, we face the problem of trying to eliminate or at least reduce those hazards. The following discusses some of these problems and the subtleties in implementing corrective actions. Being overly conservative in your short circuit analysis may result in the required PPE protection category being set at a level higher than necessary. The above figure is a person in a full Category 4 suit. This suit will provide the necessary protection, but it is cumbersome to work in, it is hot, and it provides poor visibility. The suits will make many tasks very difficult, if not impossible, to perform. Because of their restrictions to vision and movement, they may even make some tasks more dangerous. There are definitely times when this type of protection is both necessary and required, but being overly conservative will result in excessive stress to workers and unacceptable time to make repairs or adjustments. Relying upon quick analysis methods can expose you to unexpected liabilities. There are a number of shortcuts being offered by individuals and companies that can have disastrous results. Be sure that your methods will stand up to analysis and peer review. Cure-all solutions are being promoted, such as the installation of current-limiting fuses. Pfeiffer Engineering is a firm believer in the use of fuses, particularly current-limiting types, but as will be shown below, they are not always the answer. They are definitely not a quick fix solution. Being overly conservative when performing a short circuit analysis results in the misapplication of circuit protection equipment, which in turn has the consequence of calculated Arc Flash levels being higher than they actually are. The calculated bolted fault or short circuit current is a worst-case calculation that assumes very low short circuit impedance. It is a short circuit connection based upon two conductors being bolted together to form the short. In reality, most short circuits are less than ideal resulting in fault currents that are less than the alculated bolted short circuit condition. On the other hand, the Arc Fault should be a more predictable occurrence. The arc fault calculations assume that there is a physical gap between conductors that was bridged by something resulting in the formation of an arc. Once the arc is formed and plasma is produced, the arc current should closely approximate the calculated fault levels. The Arc Fault calculations are an approximation based upon research and testing similar to the short circuit analysis methods. They are not exact and therefore one needs to be careful when using the results. The solution is to first perform, as accurately as practical, a short circuit analysis. The goal for most people performing a short circuit analysis has always been to error toward the conservative. For example, when a cable length was needed, it is the practice to always use the shortest practical value, which would result in higher calculated short circuit current values. When the public utility is contacted, it is the practice to only ask for the worse case short circuit value. The overall result is that the short circuit values are always calculated on the high side. When doing a short circuit analysis for sizing the interrupting capability of protection equipment, this is the best practice. But, it is not the best practice when evaluating equipment for Arc Faults and establishing PPE requirements. This is extremely significant, and quite non-intuitive, situation. The expected maximum (worse case) bolted short circuit current. The minimum and maximum voltage to the facility. The minimum expected short circuit current. What are the minimum and maximum motor loads expected during normal operation and off-hour operation. Variation in the sources of supply to the plant, such as alternate feeders or co-generation. The data from the public utility and the determination of the facility's modes of operation should be converted into the maximum and minimum Arc Fault current at various locations in the plant. These results are applied to protective device coordination studies, where the protective devices are evaluated, and adjusted, if necessary, allowing the proper PPE categories to be determined. The figure above shows the coordination curve for the secondary of a 1000 kVA 480 V transformer. The curve shows two types of secondary protection, a fuse and a circuit breaker, each selected based upon the National Electrical Code requirements. The fuse is a KLP-C 1600A and the circuit breaker is a Westinghouse HND breaker with a Digitrip. All transformers limit the amount of fault current that can pass through the transformer. This is a function of the transformer's impedance. The coordination curve shows a line for the Isc, the maximum short circuit current that can pass through this transformer (20,741 amps). The Isc value used assumes that there actually is sufficient current available at the primary to provide 20,741 amps on the secondary. Based upon the IEEE formula, the calculated Arc Fault current Ifc is 12,230 amps. Using these two currents and the coordination curve one can estimate the time the circuit breaker and the fuse will take to clear the fault. From these current levels and clearing times the PPE category can be determined. Clearly, in this example the circuit breaker outperforms the current-limiting fuse resulting in a minimal "worker friendly" PPE requirement. In the above example both the Arc Fault current and the Bolted Fault current are less than the current-limiting point for the fuse, which is approximately 28,000 amps. Thus, there is no current-limit effect from using the fuse. Current-limiting fuses often do provide additional protection and they are very good devices but they must be applied properly. In this example, the circuit breaker provides the best protection. Studying this example further, let us assume that the fuse and the circuit breaker are at the main of a facility and the facility is served by a much larger transformer where the worse-case bolted short circuit current as reported by the utility is 60,000 amps. Under this condition the arc fault current would be 30,300 amps. In this case, the fuse would open in 1/4 cycle and would limit the fault current. 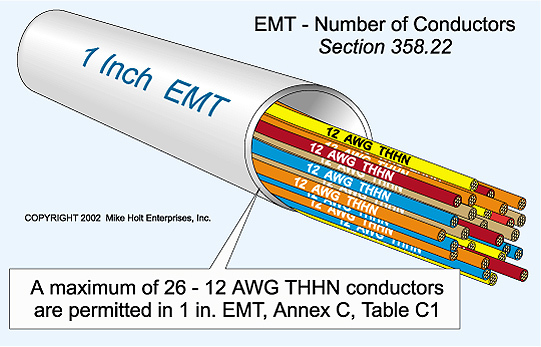 The Emb would equal 1.15 cal/cm2, which falls under a category 0 PPE. In the next example we have a fuse and a circuit breaker protecting a 125 Hp motor. The fuse is a LLS-RK 200 A and the circuit breaker is a Westinghouse HKD with a Digitrip. There are three Arc Fault currents analyzed. At an Arc Fault current of 4000 amps the fuse will begin to current limit and will open the circuit in ¼ cycle reducing the PPE category to 0. The three points analyzed show that a relatively small change in calculated bolted fault current has a major effect on the calculated arc fault current. This situation could easily lead to the misapplication of circuit protection equipment or inappropriate adjustment of same. It should also be noted that as the calculated arc fault current is reduced, the clearing time increases, resulting in the incident energy level increasing and thus, the PPE requirement increases. In reality, the arc current is primarily effected by facility operating conditions, i.e. 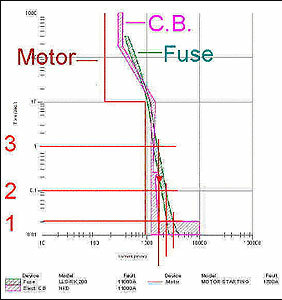 motor contribution and changes in the fault current coming from the utility. The examples illustrate that the accuracy required when calculating short currents has to be improved over traditional methods. Both reliability and arc fault conditions must now be considered when performing coordination studies. Be very conservative and require PPE 4 in most cases resulting in higher maintenance cost. Do nothing and suffer the consequences (pay later).· Perform the necessary analysis and make adjustments to reduce the arc fault conditions resulting in reduced PPE requirements. 2. A reduction in bolted fault current and thus a reduction in arc fault current can actually result in a worse situation. In the motor example above an arc fault current reduction from 4000 amps to 1800 amps resulted in an increase in arc fault energy from 0.6 cal/cm2 to 78.8 cal/cm2. Exactly the opposite one would expect before doing the math. In terms of the above example coordination curves, this occurs because the arc fault current moves from the instantaneous portion at the bottom of the coordination curve to a point higher up, incurring a the time delay before the device trips. 3. Overly conservative short circuit analysis will result in bolted short circuit numbers that may well result in the misapplication of circuit protection equipment. 4. It is very important to obtain the minimum available short circuit current as well as the maximum short circuit current from the electric utility. Voltage fluctuations in the plant supply should be considered when developing the short circuit calculations. The arc fault calculations need to be evaluated at more than just the worse case and the minimum case conditions. In the example above, a reduction in the arc fault current actually resulted in worse conditions. This represents a subtle, but extremely significant, change in the methodology of short circuit analysis. 5. Apart from the fines, nominal compliance with the regulations will cause workers to have to wear cumbersome PPE. This will result in little or no high voltage maintenance being performed, eventually compromising safety, equipment operation, and ultimately productivity. 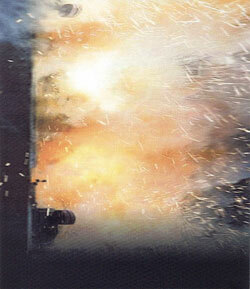 Arc flash is a risk management issue. 6. Have a registered professional engineering firm perform the calculations for arc flash hazards for the devices in your facility and have them recommend any necessary plans that when executed would result in the lowest category of PPE being required. Available short circuit current from the utility may vary, particularly in areas where there has been a significant expansion of, or change to, the electrical systems. The number of motors running at the time of a fault affects the amount of short circuit current and arc fault current available (motor contribution). The facility voltage often varies as a function of time of day. The utility is often more loaded during the day. The available short circuit current. Dirt buildup in the equipment that may affect the conductive path. Bolted Fault - Short circuit current resulting from conductors at different potentials becoming solidly connected together. Arc Fault - Short circuit current resulting from conductors at different potentials making a less than solid contact. This results in a relatively high resistant connection with respect to a bolted fault. 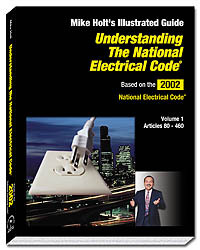 Understanding the NEC Volume 1 was written to provide insight into, and an understanding of, many of the technical rules of the NEC. This book, printed in four color, contains clear graphics, examples, and 1200+ summary questions. Based on the 2002 NEC.